ClipboardFusion scrubs text copied to the clipboard so that it can be pasted into different applications without formatting. It can be done automatically or with a customizable HotKey. ClipboardFusion can replace clipboard text with pre-defined strings. Maybe you want to replace all '&' symbols with their HTML equivalent, &amp; - it's up to you! Quickly access ClipboardFusion by setting up customizable key combinations you can press at anytime. ClipboardFusion is always at your fingertips! Create your own macros using C# in the integrated editor to perform completely customized transformations on your text. The power of the macros is only limited by your imagination. Also, be sure to check out the pre-made Macros, created by other members of the ClipboardFusion community. Customize the way you use your Clipboard by setting up different actions to do almost anything you can think of - in the blink of an eye! Create a Binary Fortress Account and sync your clipboard text with other computers or devices, or just store it so you can use it again later. Sync with Android, Apple iOS, Windows 10 Universal, and more. Sharing your clipboard with all of your devices has never been easier! 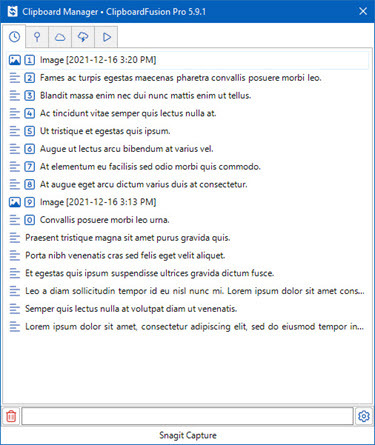 The ClipboardManager is the main focal point of ClipboardFusion. You can view your Clipboard History, Pinned Items, Online Items, and your custom Macros. Edit, pin, sync, search, reorder, and use your items all from one window! Everything you send or receive using the Clipboard Syncing feature is encrypted using 256bit encryption. ClipboardFusion's basic functionality is free for you to use on your personal computer, no strings attached. If you would like to take advantage of Clipboard Syncing and more advanced Trigger actions, check out our Pro licences. Try ClipboardFusion right now completely free for 30 days! "We copy a lot of data on our Windows computers. Did it ever happen with you that you wanted to access something that you copied earlier? Well, a well-defined category of software is available to do such tasks. And the category is clipboard manager software. In this post, we’ve covered a free and more importantly a useful clipboard manager called ClipboardFusion. It is a free clipboard manager for Windows 10/8/7 that can maintain history, remove text formatting, run powerful macros, replace clipboard text, and more!" "I recently bought FileSeek Pro then ClipboardFusion. Very helpful for power users. So much of your ideas should have been implemented by Microsoft long ago. I'm happy that you help developers with your inexpensive jewel tools!" "To say that I’m impressed with your response is an understatement—never did I expect you to deliver a personalized solution, much less with a turnaround time of just a day. With this kind of customer service, I will take a look at the paid versions of your products. And, I will pass along my recommendations to my students and clients in the IT and educational fields." "I just wanted to take a moment to thank you for your Clipboard Fusion program. I'm sure lots of folks use your free version, but some of us realize that folks like you do put effort into creating, maintaining and improving these products, so... that's why I purchased a copy. No, my purchase won't make your next car payment for you, but I wanted to let you know that your efforts are appreciated."